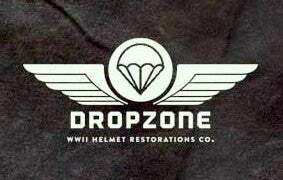 Dropzone Helmet Restorations Co. — WWII "Inland Style" M-1C Paratrooper M2 Airborne Helmet Liner. For sale is a 50's Westinghouse helmet Liner fully restored as an "Inland Style" with HBT Webbing, steel (Parkerized) A-washers, sweatband & nape strap. Converted into a Airborne Jump liner. Marker mark stamps are clean & very legible. OD#3 A-yokes with wire buckles, liner strap & chamois lined chincup are all aged by me. Webbing, Hardware & parts are supplied by Jmurrayinc1944, At The Front, Garcia Aviation, DOT/Scovill & Anchor. M-1C Paratrooper M2 Airborne Helmet Liner.